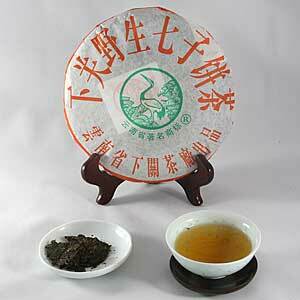 This tea is produced from leaves picked from wild tea trees. It has very unique and complex characteristics that set it apart from other Pu-erh teas, one of which is that it has a pungent wild camphor flavor that is quite energizing. This tea, the color of gamboge when brewed, is an ideal drink in the afternoon when a "lift" is needed. It is also recommended for consumption after a meal to aid digestion. The tea is best on the third infusion and has great aging potential. We are thoroughly enjoying the samples. The Xiaguan and Denong are exactly as you have described. Wonderful and very fine Pu-erhs.